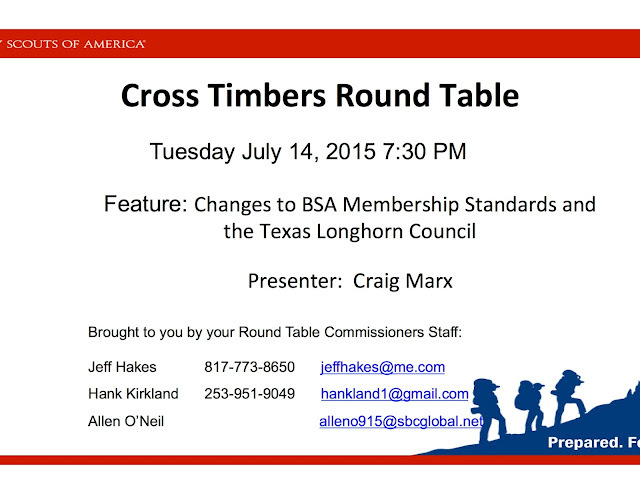 For tomorrow’s Round Table, there is a change to where we will meet at Pantego Christian Academy. Because the Academy is remodeling the cafeteria where we usually meet, we will meet in the MS Cafeteria. The MS Cafeteria is located in the eastern most building of the campus. It is labeled as the Middle School on the outside of the building. Entrance is through the front, main doors. The cafeteria is located at the back side of the building. After you enter, you go to the right and then make two lefts through the hallway to the cafeteria. If we still need a Cub Scout RT breakout, then the library is available as usual. For those of you that aren't aware, on May 21 Robert Gates gave a speech at the 2015 National Annual Meeting in Atlanta, Ga. In that discussion he indicated that another change would likely be forthcoming from National regarding the policy currently restricting LGBT leaders from being part of the BSA. • We face increasing legal challenges at the federal, state, and local levels. Today, 21 states, the District of Columbia, and more than 140 cities and counties have enacted laws prohibiting discrimination on the basis of sexual orientation. • Impending legal action means a court could make an overly broad ruling forbidding any kind of membership standard, including our foundational belief in "Duty to God." The best way to avoid this possibility is for the BSA to set its own course. • The BSA is considering the removal of the national adult leader restriction related to sexual orientation, while preserving the rights of our religious chartered organizations and respecting their diverse beliefs. On Wednesday June 17, Longhorn Council held a meeting of all the Key 3 District Leadership to discuss the speech and the possible impact on our organization. While there hasn't been any formal announcement from the National office, the Longhorn Council leadership believes that the BSA Board may be implementing this change to our bylaws within the next 30 to 90 days. It remains the position of the Boy Scouts of America that the ideals and principles of the Scout Oath and Law are central to teaching young people to make better choices over their lifetimes. As a result, when the national policy is changed, we believe that the membership qualifications will be pushed down to the charter organizations so that they can define what's allowable or not based on the charter's bylaws. With this change, charters exercising their First Amendment rights, will still be allowed to decline any application based on the tenants of their faith. • This revision will allow Scouting's members and parents to select local units, chartered to organizations with similar beliefs, that best meet the needs of their families. • No one in Scouting will be asked to join a unit that compromises their personal religious values. • The BSA will continue to legally defend (indemnify) the rights of its religious chartered organizations. • Legal consultants believe this position/paradigm will survive legal challenge based on First Amendment rights. • Scouting has always held that sexuality is a topic for family and religious discussion. That has not changed and remains Scouting's position – emphasized now more than ever – Discussions concerning sexual matters are prohibited in Scouting contexts and left to parents and religious leaders. • Scouting will continue to emphasize YOUTH PROTECTION and lead the nation in this area. Our YPT program will protect our youngsters and new standards call for an even greater emphasis on no tolerance for YPT violations. • Boys and girls who come from religious traditions where homosexuality is accepted will still be able to participate in Scouting. Our District Leadership Key 3: Tracy, Craig and I ask you take time to prayerfully consider your commitment to the BSA and our scouts. If you feel that you can no longer support our organization with these changes, please let us know in the next few weeks because we need to ensure that our leadership is committed to the success of our mission, the youth of our community. Those who are willing to continue to serve, with enthusiasm, need to pull together all the more cohesively and powerfully as our movement responds to this transition. He has committed to read all the communications, but cannot guarantee that he will respond to each member directly. Tomorrow night at the District Committee meeting I will review a Power Point presentation that was presented by our Council President, Jim Patton, at the June meeting. This coming Thursday morning at 9:00 am be at your computer and log on for the "lottery win" of the season. FOR THOSE NEW FOLKS, THIS IS HOW WE GET A WEEKEND FOR SHOW AND SELL AT CABELA'S OR BASS PRO. WE ARE NOT ALLOWED TO GO IN AND SOLICIT THE STORE OURSELVES FOR A WEEKEND. Any questions get with Renee Horton,rhorton@bsamail.org. After 9am on Thursday the 9th of July it will be too late. These slots are usually taken up rather quickly! Please don't be discouraged if you do not get a weekend at one of these 2 locations. There are many other locations to get a weekend to do sales in front of a store front. YOU just have to hit the pavement, preferably in uniform and have your calendar with you…speak with a storefront manager, ask if your unit may sell in front of their store and if so, when…have them and you log it on a calendar, get a confirmation note if at all possible, especially when dealing with major store fronts. Cabela's and Bass Pro shifts go live on July 9th at 9:00 a.m., popcorn page on Longhorn Council website, click the link and sign up. Remember if you do not get a confirmation (you did not get a slot) do not go to the store and ask someone to share with you. We have had that happening and we are not allowing that this year. If you have a confirmation that you have a shift take that to store please. Thank you for your help resolving this issue.